Last June my husband, son, and I went for a weekend trip to San Antonio. Our last stop before we left town was the Pearl Farmers Market on the north end of the River Walk. A coworker of mine had raved about the Pearl Farmers Market for several years and while we had been able to visit the Pearl shopping area and restaurants (get some tacos at La Gloria!) on a previous visit, this was our first time to the market. As we were walking through the vendors, I stopped when I saw the word permaculture listed to describe Talking Tree Farm. As much as I was familiar with permaculture from books, podcasts, and gardeners applying permaculture principles to their own gardens, I had never seen a permaculture farm selling goods at a market! Completely enthralled, we talked to Sylvain and Sarah Clavieres for a bit about their produce and farm, and I ogled at Sarah’s beautiful handmade jewelry. They had been featured in an issue of Edible San Antonio and had several copies to give away for customers so I picked one up. After taking a photo of the two of them—I had to have proof of a permaculture farm in Texas! !—we drove back to Houston and I contacted Sarah shortly after about possibly coming on the podcast. The timing wasn’t right at the moment for them as they were about to leave the country but I kept a mental note to touch base with them later in the year. Well, time slipped by and it wasn’t until I pulled out that Edible San Antonio magazine several weeks ago that I remembered the encounter. 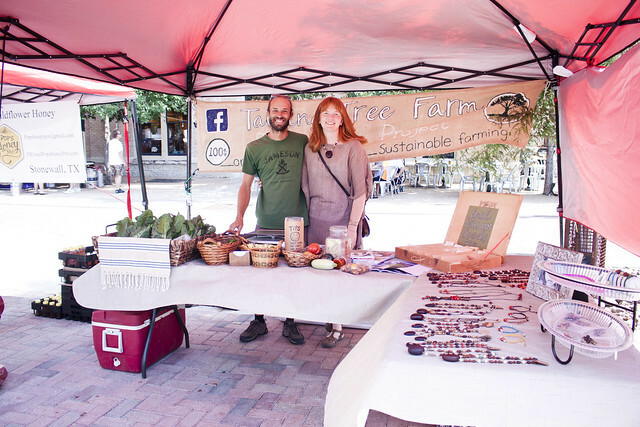 Luckily Sarah and Sylvain were game to come to come on the podcast and have a chat about their farm and what they are working to create for San Antonio. Seeing permaculture in action, actively providing food for the community, and creating a different and unique method of agriculture in an area where mono crops are the norm—well, I consider what Sarah and Sylvain to be working towards to be the step in the right direction for food systems in Texas. You can keep up with Talking Tree Farm via the link above or through their other social media sites below and definitely plan to stop by and check out their produce the next time you are in San Antonio! And I’m quite certain I completely mispronounced Sylvain’s name! My 2 years of high school French from 20 years ago has absolutely been caked in rust! The Pearl Brewery Main Website links to the restaurants, farmers markets, etc are within.